Limited edition of 1864 prints, 20"(524mm) x 29"(743mm), 25th June 2005. 'Memories of Bristol' was the first of Stuart's Bristol paintings. 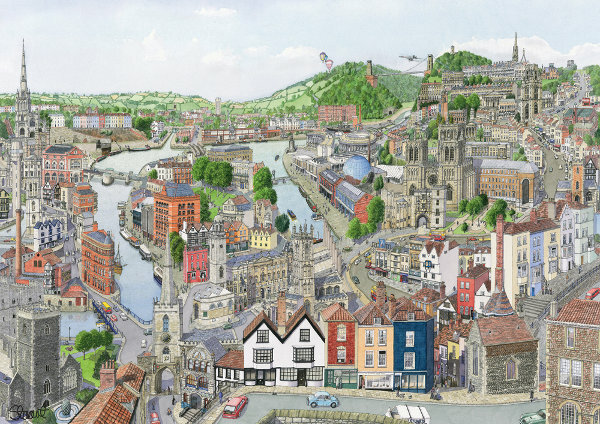 The limited edition print sold out in record time and the artist was requested on many occasions to revisit the city to create another Bristol cityscape in his unique style. Before returning to compose this picture in 2004 he first completed Edinburgh, Sydney, Dublin, Boston as well as three London paintings. After 'walking the city' Stuart returned to his attic studio in Wales with his sketches, photographs, guide books, and maps, to start the creative process that would take eight months for him to complete the new Bristol painting. The result of this work appears above and reflects his appreciation of the special Bristol cityscape. The orientation of this imaginary scene is from the north of the centre compared to the general view from Spike Island in the first Bristol painting. Here the detail of St Michael's Hill and Colston Street are in the foreground with a scene down Christmas Steps to the revamped Centre Promenade figuring prominently. The detail of St Peter's and St Michael's churches and the Corn Street area are brought more to the fore in this composition. Needless to say, Park Street, the Clifton crescents, the Gorge, Clifton Suspension Bridge and the Floating Harbour play an important part in the creation of his imaginary cityscape. Stuart wanted this limited edition of Bristol prints to reflect a meaningful date in the history of the city, and decided on the opening of the Clifton Suspension Bridge in 1864 to be the determining number of copies that will be available. The original watercolour hangs pride of place in his home, and the prints have proved popular both locally and further afield to those with Bristol connections.